A: There is a third unit on the ground-level that is part-time occupied by the Hola Paradise owners (a recently-retired couple) and which does not get rented. The owners occupy their personal unit at various times throughout the year, including for the duration of each winter. With private indoor and outdoor spaces of their own, they do not share in any of the spaces or amenities listed/shown on this website. Q: Should I be worried about sharing? A: No. The property has been designed so that virtually nothing is shared. Each unit has its own private outdoor space, as shown in the respective floorplans (see Middle Unit; see Top Unit). Parking area and exterior stairs aside, the only shared amenity is the beach/ocean gear. The 12-inch thick concrete walls and ceilings mean that noise between the units is essentially non-existent. That said, outdoor noise can travel, and so a basic level of respect is expected, not only for the sake of occupants of the other unit, but also for our neighbors. A: The beach out back is awesome! The strip of sand between Hola Paradise' seawall and the ocean's edge is generally 50+ feet deep, and the beach runs for miles in both directions. Click here for a beach pic taken from about 1/2 mile to our east; we're the only 3-story beach house around, making us quite easy to spot! As for the ocean, the answer mostly depends on the season. In the summer, the water generally lays quite flat and is good for swimming, rafting, stand-up paddleboarding, etc. There is a mix of sand and reef. In winter - and to a lesser extent, fall and spring - we receive pretty regular swell that produces great surfing waves. 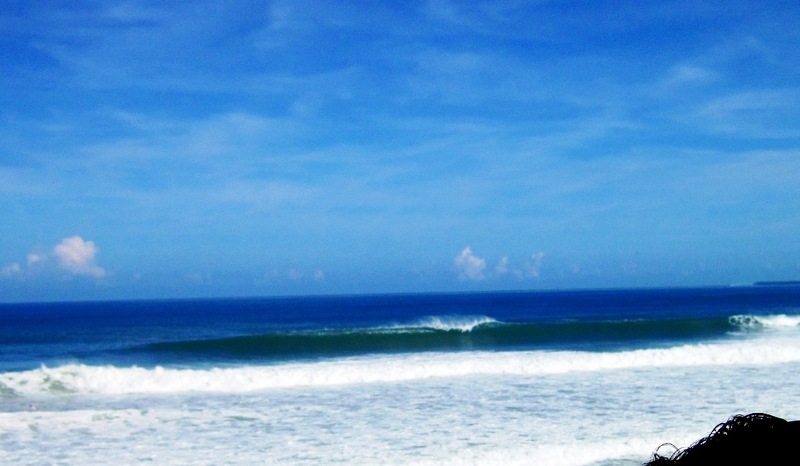 Click here for a pic taken from the house of a perfect a-frame wave; click here for a link to an area surf map. Q: How do I access the beach? Q: How's the reservation process work? 1.) Contact Us to receive a quote and a link to your online rental agreement. 2.) Complete/Submit your online rental agreement and remit a 25% non-refundable deposit via PayPal. We'll secure your dates on our calendar and email a confirmation with directions, lockbox code, and emergency contact info. 3.) Remit payment, again via PayPal, for your balance 60 days prior to your scheduled arrival date, and you're all set! Q: Where's Hola Paradise located? Most familiar with the region would agree that the "Puntas" area (i.e. barrio) is Rincón's heart-and-soul. At that soul sits the legendary beachfront bar, Tamboo. 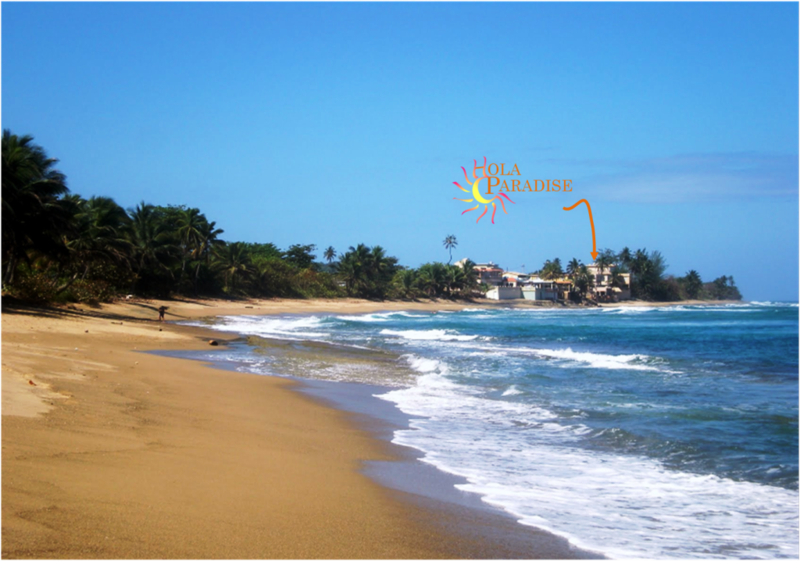 Hola Paradise is 1 1/2 miles from Tamboo, about a 40 minute walk down the beach or a ten minute (somewhat circuitous) drive. Q: Which airport? And do I need a car? A: Hola Paradise is a 28 minute drive to/from Aguadilla (BQN) airport, and so if you can do it, that's the obvious choice. But Aguadilla's limited routes and odd flight times (think: 2-3 a.m.) can be deterrents for some. San Juan (SJU) airport is a 2+ hour drive and offers dozens of flights daily. We absolutely recommend renting a car, as public transportation is all but non-existent and things are pretty spread out. That said, you could survive without a car (ex: there's a small market a few minutes walk away...plus waves right out back!). It's just that you'd likely miss many of the area's attractions, whether it be the farmer's markets, the famous Art Walk, the magnificent area restaurants, etc, etc. Transport to/from the airport may also prove tricky.